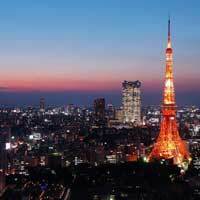 Looking for a cheap ticket to Tokyo? Here you can search all major low-cost airlines for cheap flights to Tokyo. Before you book a flight you can use Utiket to find the cheapest flights to Tokyo for Japan Airlines (JL), Garuda Indonesia (GA), Korean Air (KE), Asiana Airlines (OZ), Cathay Pacific (CX), China Airlines (CI). All flight data are real-time and accurate. Follow the links to search and book your cheap ticket to Tokyo directly with the airline or one of our partnering travel agents. The metropolitan area of Tokyo is being served by several airports: Haneda Airport, Narita International Airport. You can find more information or the cheapest tickets to all these airports here on Utiket. Tokyo Haneda Airport, or also known simply as Haneda Airport or Tokyo International Airport is one of the two airports serving Tokyo, the other one being Tokyo Narita Airport. With almost 70 million passengers a year the airport is the fourth busiest in the world (after Atlanta, Beijing and Heathrow). Read more about Tokyo Haneda Airport. The Tokyo Narita International Airport, or also sometimes called Tokyo New International Airport, is the main international airport of Tokyo and is with 35 million passengers the second busiest airport in Japan. Read more about Tokyo Narita International Airport. This is a list of all airlines flying to and from Tokyo and how many flights and destinations they serve. You can see a complete list of airlines and flight options to Tokyo. Need place to stay in Tokyo?